Seriously - Chucky wishes he was half as scary. And I know that they're going to fix him up and put him back out there for next year. Good as new. Except they'll have to replace his electrical systems, of course, and will probably take the liberty of giving him newer, more articulated movements when they do. They'll need to replace his burnt-up face too, and if you're going to do that, you might as well "update his look" for the 21st century - shoot, maybe redesign him right out of the uncanny valley altogether! And this is where Keats screwed up on the Grecian Urn. Yeah, forever wilt thou love and she be fair... until somebody gets drunk at the company Christmas party and accidentally topples your Grecian asses into a million shattered pieces on the floor. Not so immortal now, are you? So what I'm saying is this: we spend our lives coming to grips with the reality that all the people and creatures we love will change and eventually die, and it is damned annoying when the stuff you reasonably expect to stay the same, doesn't. But then, I guess that's how we make room in the world for new things. Anyway, going to the fair with the fam tomorrow, and I think I'll lay a corn dog down for Big Tex when we do. Thanks for all the nightmares, buddy. The best thing, though, in that museum was that everything always stayed right where it was. Nobody'd move. You could go there a hundred times, and that Eskimo would still be just finished catching those two fish, the birds would still be on their way south, the deers would still be drinking out of that water hole, with their pretty antlers and their pretty, skinny legs, and that squaw with the naked bosom would still be weaving that same blanket. Nobody'd be different. The only thing that would be different would be you. I read about this. Yeah, that guy would scare me too. The story reminded me when Big Butter Jesus, or Touchdown Jesus, as Ohioans liked to call it, burned up after a lightning strike I think it was two years ago? When driving I-75, just north of Cincinnati you couldn't miss the statue of Jesus's torso sticking out of the ground with his arms all stretched out. They are, or maybe have by now, replaced it with a lightning safe version, instead of just a torso though it's a whole body Jesus. Haywood Banks even did a song on Big Butter Jesus, it's pretty hilarious. 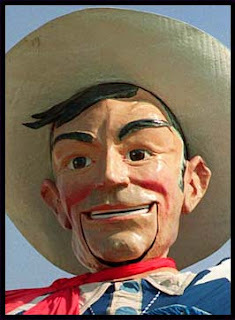 I only saw Big Tex once, so I didn't really form an attachment to him. I think they should just burn him every year at the close of the fair. It would be like Burning Man for the state of Texas. Oooh, sounds like just the sort of American memories I'd like my kids to have. Which museum is this? In Denver there was this theme restaurant called Casa Bonita. Thirty-five years later the floor show still consists of a gorilla stealing the wig off a lady reporter and throwing her over a fiberglass-and-plastic jungle waterfall. And the cockroach tacos taste just the same. K.E. - oh my God. That was the single best Google image search I've done all week. I'd never even heard of Touchdown Jesus - what a landmark! Somebody needs to make a catalogue of these things, so that somebody else can then write a travel book about seeing them all. In the meantime, I clearly have some listening to do! Kimberly - Big Tex lives at the State Fair of Texas, so you would need to wait 'til September 2013 to see him. The thing at the bottom is a quote from Catcher in the Rye, where Holden Caulfield is talking about the Museum of Natural History in NYC. (I liked it, because it was a pretty good summation of why we like some things precisely because they're always the same.) Also: totally up for gorillas and fiberglass waterfalls, but I'm drawing the line at cockroach tacos. I mean really. Pam: you are sick and twisted and massively irreverent, a GREAT reminder of why I like you so much. Heresy! Your Brain. Let Me Lick It.